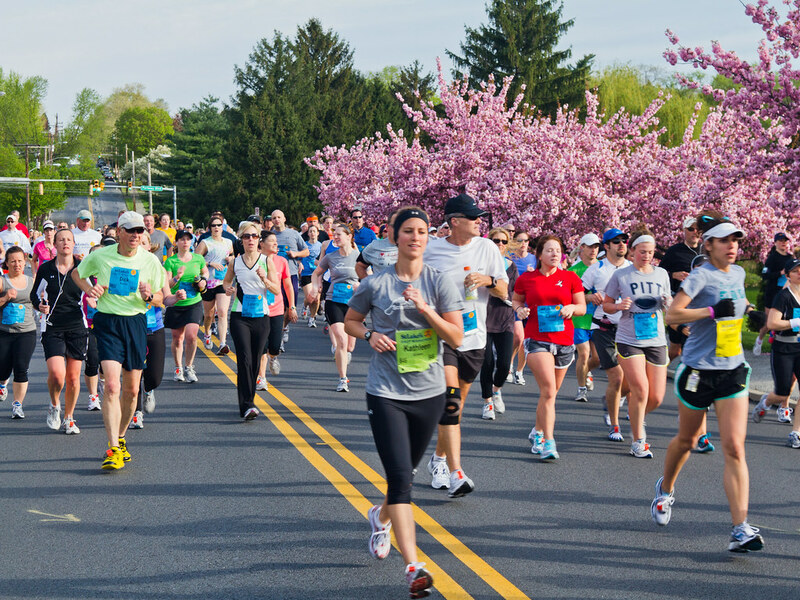 This weekend is the St. Luke’s Half Marathon. If you’re participating, hopefully you’ve trained well and are in the best shape of your life. Good Luck! For everyone else, let’s go over the basics of training for a Half Marathon and some things to remember for the day of the race. First of all, don’t make an amateur mistake. Years ago, runners thought that ‘carbing up” before a race meant eating piza or pasta, but that can be disastrous. Loading your GI tract with heavy foods like that will slow you down during the race and you’ll probably run out of gas before the halfway mark. You might also experience some GI discomfort which will be intensely uncomfortable when your body is in overdrive. It’s true that your muscles need carbs before a race, but get them in the days leading up to the race, not directly before. Two days before the race start loading up on sports drinks and fruit juices and avoid any alcohol. Also avoid high fiber foods like beans and broccoli during this time and fatty foods like peanut butter and fried foods. On the day of the race, don’t eat any solid food for 3 hours before the race, but drink lots of water. The ideal breakfast? A bagel and fruit juice. After the race, replenish your body’s energy stores as soon as possible with light, healthy foods and more water. If you’ve been sitting on the couch for the past year, I’m happy that you’ve made the decision to run. However, don’t do too much too quickly. You really should start your training 12 months before the race. If you’re in better-than-couch-potato shape, but not great shape, you should start about 26 weeks before race day. One key to an endurance race is finding your stride, one you can maintain the entire race. Overstriding leads to quick burnout and understriding means you’ll finish in the back of the pack. Former Olympic sprinter Samantha Clayton says that you can find your perfect stride length by focusing on your arm movement. “Run at 70 percent of your maximum speed with your arms bent at a 90-degree angle, driving them back and forth to a full range of motion. Over-reach your arms and watch your stride length increase; limit your arms’ range and your stride shortens.” Your perfect stride is somewhere in between. Correctly fitted athletic shoes are a must. They’ll offer proper support for your arches and ankles, will absorb the hard surface impact and keep you from experiencing fatigue early on. Proper athletic shoes are best bought at a store that specializes in footwear for athletes. On the day of the race, wear double layered athletic socks to avoid blisters. During your training routine, don’t go for broke. Slowly increase your mileage and intensity until you’re up to the half marathon distance a few weeks before the race. Don’t forget to take days off from your routine, because resting is just as important as training, as it allows your muscles and cardiovascular system to recover and strengthen. If you live in an urban area, train in the early morning when air pollution is at its lightest. As a preventative measure, ice your shins or any other potential problem areas in your legs, ankles or feet for about ten minutes after a long run. Do this routinely, even if you aren’t experiencing pain, as icing reduces any minor inflammation that may have set in without you being aware of it. And lastly, the best runners “clear the chute before they commute”. Drink as much coffee as necessary a few hours before the event. I’m sure you get my drift. Your body will be working hard during the marathon and you don’t want to have to hunt for a bathroom during the competition. Here’s an excellent half marathon training schedule from Shape magazine and a novice training schedule from author and runner Hal Higdon.